When the world thinks sports betting, they think WagerWeb. The name is synonymous with playoff action, including NBA, NHL, MLB, and NFL. And when it comes to betting on the Belmont Stakes, Preakness Stakes, or the Kentucky Derby, WagerWeb has become a top destination for new sports bettors and pro bettors. 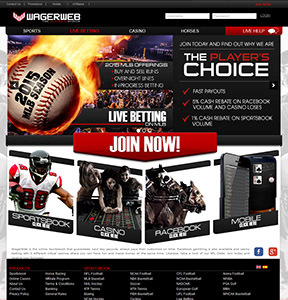 WagerWeb doesn’t just offer a racebook and sportsbook. They also offer a full casino where you can play your favorite games. Keep reading to discover how everything stacks up at WagerWeb. If you never want to miss a beat (or more specifically, a bet) you definitely should put WagerWeb on your short list. With live betting, you can bet on games as the action unfolds. And you can bet from your mobile device, too. Imagine being at a game and betting on it from the stands. You can’t beat that. The overall betting platform on desktop and mobile is second-to-none, and the lines are fairly competitive, though we always encourage sports bettors to have multiple sports betting accounts to benefit from the best lines. WagerWeb is a pretty big name, so they don’t have to offer big promotions to get people to sign up. That’s good, because it says that they’re honest and reputable. But it’s also a bit of a negative point if you’re a new bettor looking to sign up. With that said, WagerWeb does offer a 5% cash rebate on racebook volume and casino losses, plus a 1% cash rebate on sportsbook volume. It’s not incredible by any stretch of the imagination, but it’s better than nothing.